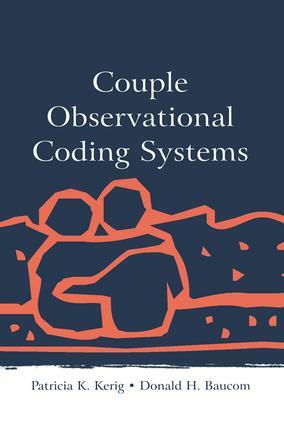 A companion volume to Family Observational Coding Systems, this book moves from the triad to the dyad and provides a showcase for significant developments in the coding of intimate couple interactions. The hope is that this book will contribute to the broadening and deepening of the field by disseminating information both about the coding systems that have been developed, as well as the conceptual and methodological issues involved in couple observational research. The first three chapters present overviews of conceptual and methodological issues in the study of couple processes. The remaining chapters describe contributions to the field by 16 teams of researchers. Each chapter provides information about the conceptual underpinnings and structure of the coding system developed by the authors and evidence for its psychometric properties. Couple Observational Coding Systems will be of interest to researchers studying couple interactions as well as clinicians who work with couples.